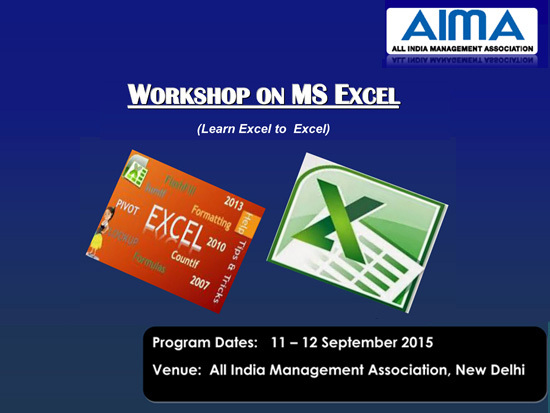 A 2 day workshop on MS Excel was held from 11-12 September 2015 in New Delhi. It was a new initiative to provide a conceptual understanding on the topic and to make the participants experience the relevant aspects of MS Excel. It comprised of several interdependent modules/sessions each focusing on different functionalities of MS Excel. Special emphasis was given to the Data Analysis and Reporting through MS Excel. The workshop attracted corporates and professionals along with IT faculty. 18 participants attended the same. Based on the feedback received AIMA –CME will organise a more focused programme on the topic to develop the expertise in the field of Spreadsheet Computing.